Panel 1: Establishing shot of a well lit deep space outpost. 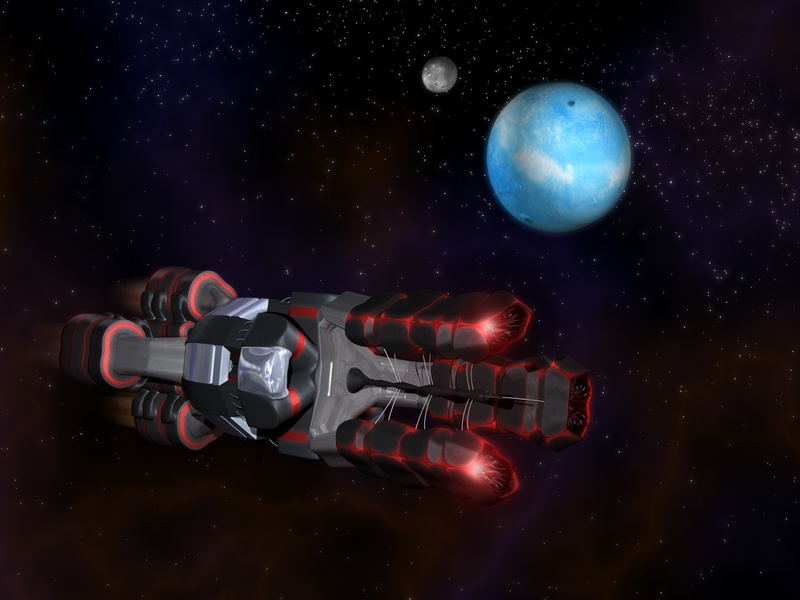 There are a few stars in the background, the probe is small and all alone, the portholes are all lit up brightly, too. There are also a couple of musical notes floating around, apparently coming from the probe. Panel 2: Interior of outpost. Small cramped cabin, the lone passenger sitting at control panel, large computer display panel behind him, his head is turned slightly to listen to the radio. He is preparing to strap himself into his seat. A small portable high-tech radio is visible in every interior shot from now. Panel 3: Passenger, from behind but he is now turned sideways so it is really from his side, sitting with legs up on panel talking into handheld transmitter mic, musical notes dancing around in the background. The stars are visible on the other side of him through the bridge window in front of the control panel. Panel 4: Overhead shot of passenger strapped in, musical notes still floating in the the background. A countdown is coming from the control board. The Passenger has a broad, pleased smile on his face. Panel 5: Exterior of ship floating dead in space, musical notes coming from it, but now there are no lights in the port holes, and the rest of the ship is no longer well lit. Panel 1: Interior of ship. Things are all kind of dark, the passenger is hovering over the transmitter. Smoke is floating about and obscuring the computer off to one side. Musical notes are partially obscured, too. Panel 3: Exterior of ship. It is fairly well lit, but not quie as well as lit as the very first panel on Page 1. Musical notes are still floating around. Panel 4: Exterior of ship again, but now there is a second ship next to it. It is the rescue ship and it is docking. the outpost is even less well lit than before, but there is still some light in the portholes. Panel 5: Interior of ship, rear view of passenger. He is sitting in his chair, faced away. His hair is very gray. There are a lot of shadows here, and it is kind of dark. Panel 6: Interior again. this shot is from in front of passenger, still in the same position as before. It is still kind of dark and shadowy. Behind him a lighted passageway is visible and the silhouette of a man can be seen against the wall. The passenger is now just a skeleton, there is an almost sad smile on his skull/face, and what appears to be a tear in his eye socket. Musical notes are floating about, also.